I’m not too sure how authentic my version of this pastry ended up tasting, I couldn’t find any ground mace, which I know is one of the vital ingredients. A bit of creativity with some nuts & seeds were needed to disguise the craggy top! This pastry was quite unusual – a layer of marzipan sandwiched between 2 biscuit layers. I hadn’t imagined making marzipan (or mousy-pan, as my mum calls it…) was so easy. This was a tasty treat, thank you Francjin for the challenge! Speculaas spices can be bought in a store. But it’s more fun to make your own mixture, so that you can adjust the flavor. Here is a representative recipe from the extensive Dutch tradition. This method yields at least 4 and at most 18 teaspoons of spices, so if you plan to mix just a few spices, use bigger or more spoons to get a reasonable amount. Take your time to smell the ingredients individually before you decide how much to add. And remember the proportions, that will make adjustments easier next time. As we are going to make stuffed speculaas, we will need almond paste. You can buy it in a store, but homemade almond paste tastes better. Add the egg and let the food processor combine it – if it is powerful enough. Otherwise you will have to combine it with your fingers. Store the almond paste in an airtight container in the refrigerator. Although the flavor gets better as days pass by, it is not wise to store the paste for too long, as it contains a raw egg. For the same reason you should not eat the paste unbaked. Put flour, baking powder, sugar, salt and spices in a bowl. Cut the butter in dices and add. Feel free to add a little milk if the dough is too dry. You can choose to make the dough a few days in advance, just like the almond paste, that will benefit the flavor. Freezing is no problem. 3. Divide the dough into two portions. 4. Roll out both portions on a lightly floured surface, until they are exactly as big as the baking pan. 5. Put one of the layers in the pan and press it lightly to fill the bottom. 6. Lightly beat the egg with a teaspoon cold water. 7. Smear 1/3 of the egg over the dough in the pan. 9. Press the paste lightly down to fit in the pan, and smear the next 1/3 of the egg over it. 10. Now put the second layer of dough on top of the paste, press it lightly, and make as smooth as possible. 11. Smear the last 1/3 of the egg over the dough. 12. 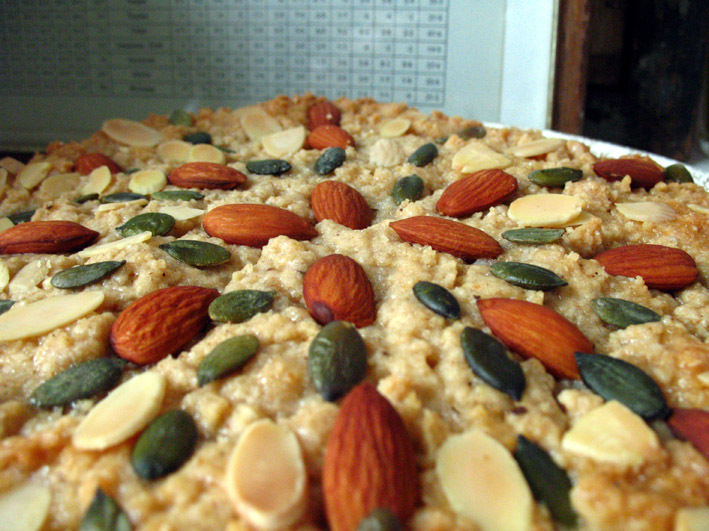 Decorate the pastry with the almonds. 13. Bake for 40 minutes in the preheated oven. 14. Let cool completely in the pan, then cut it in portions as you like. 15. If you wrap the stuffed speculaas in clingfoil, after it has cooled completely, you can store it a few days at room temperature. Freezing is possible, but fresh speculaas tastes better. Almond paste: keep it in the refrigerator. Some people keep it there for months, but if it contains raw egg, I recommend not more than a few days. Can easily be frozen. Speculaas dough: can be kept in the refrigerator for days, or in the freezer for months. But remember: fresh tastes better. Stuffed speculaas: if you let it cool completely, you can wrap it in clingfoil and keep it a few days at room temperature. And again: freezing is possible, but fresh is better. 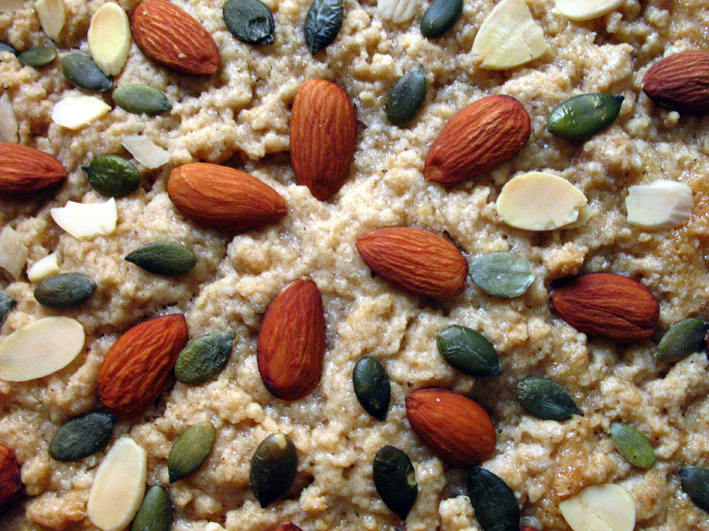 I enjoyed this – it tasted great and the pattern of nuts and seeds on top looked amazing. Also I love mousy-pan! The pattern of nuts and seeds on the top looks really beautiful! And yes, I was also surprised and how easy it is to make marzipan! The nuts you used to hide the surface give your speculaas a very nice look. Well done!